Having lived in Hawaii for so many years, one thing that stood out from our past trips to Korea was that sushi and sashimi in Korea were... different. 초밥, Korea's version of sushi, looks similar but tastes quite different. 회, Korean sashimi tends to be made with firmer and chewier types of fish, including 멍게 (Aaron's least favorite "food" in this world). 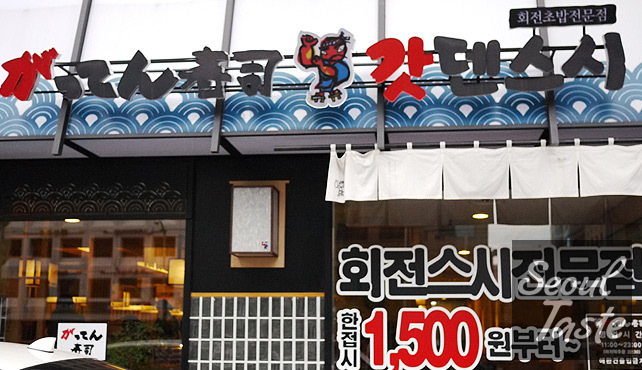 Sometimes I do crave Korean 회, drenched in that spicy, vinegary, sugary sauce... but today, we're going to eat sushi. The real thing. This place opened in the spring of this year near Gangnam Station. The moment you enter, you are greeted loudly. When you are seated, the server will introduce you and the sushi chefs will then greet you directly with loud 'welcome'. 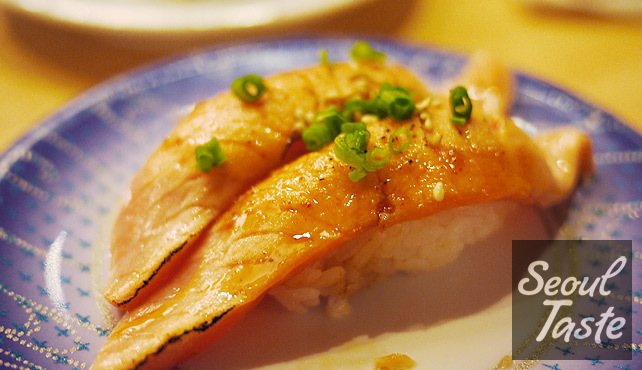 This reminded me of our other favorite Japanese restaurant, Teppen, where we enjoyed the teppanyaki and sushi. As soon as you're seated, a server in a kimono brings hot miso soup. We had nearly finished our bowls before we realized that we weren't remarking how watery or off-tasting it was. Unlike many Japanese restaurants in Korea, they serve actual miso soup! 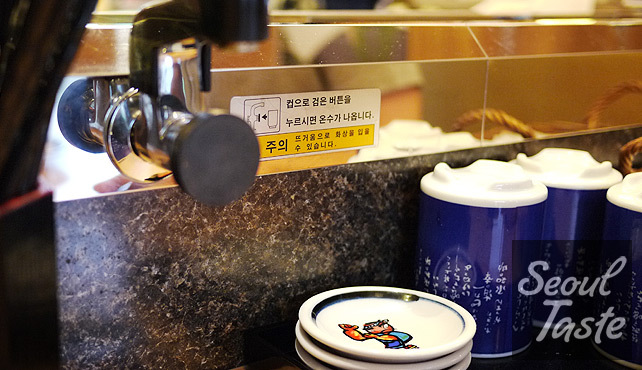 At every table, and at many places along the bar seating, you'll find matcha (green tea) powder and a hot water tap. (Be careful! Especially if you can't read the many warnings next to the hot water tap...) Pickled ginger is also provided at the table, and wasabi makes its way around the conveyor belt from time to time. Soy sauce is at the table as well (it's crowded), I found it to be little lighter than I expected. 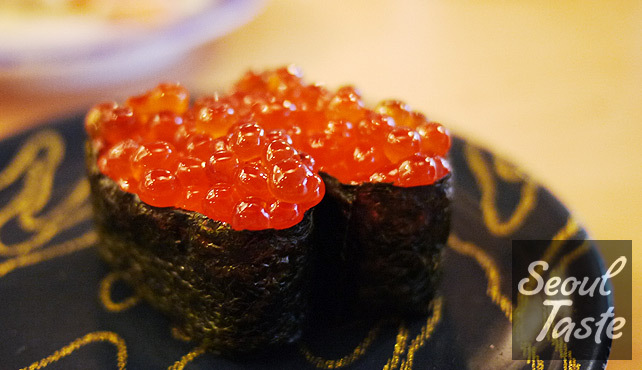 I start with one of my favorite, ikura (salmon eggs). For a long time, I never used to eat this, but once I finally tried it, I immediately fell in love with it. 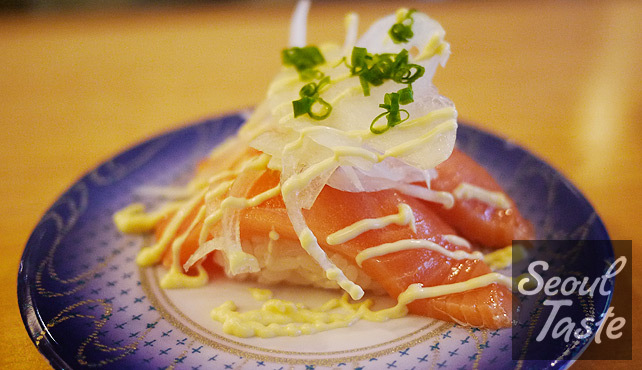 I've had this in many of Korea's so-called sushi places, but here, it was much better in terms of its rich flavor. It was salty (in a good way) and at the same time, it melted away like butter. Aaron grabs one of his long-time favorites, salmon topped with onions and mayo. Yikes, too cold! On the first try, the fish wasn't quite defrosted yet. Subsequent ones were better. While we were eating we spotted 한우타타키 going around. 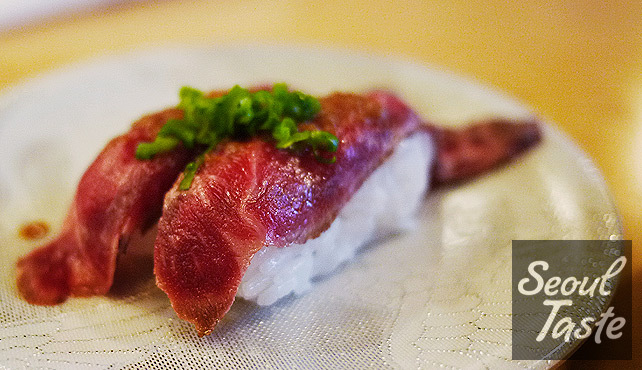 This is Korean beef, seared then sliced thin and made into sushi. This looked quite interesting and unique experience for Korea location. (In Japan, and the U.S., this is a Kobe beef tataki, but they were wise to change it to 한우 here.) The first time we thought it was a little chewy, but the second time it was excellent. You can, of course, order things from the menu instead of waiting for them to come around. Aaron orders chicken karaage (Japanese fried chicken) and I got some egg rolls and takoyaki. 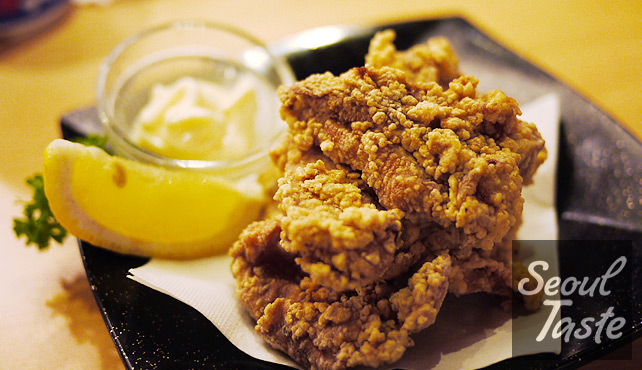 Chicken karaage was hot and tender, and it was extra tasty with the included mayonnaise. Japanese egg rolls were impressively big, but a bit too sweet for my taste. 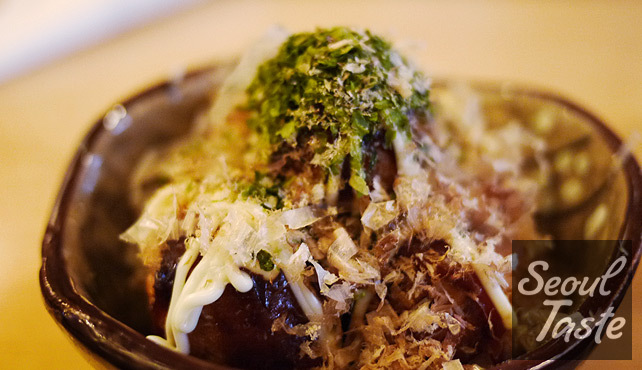 Takoyaki arrived topped with lots of bonito flakes dancing on the top. It was a little doughy for me and I thought the street version was better. Aaron liked it, and at just 1500원 for 5, you can easily decide for yourself. The fresh tuna was what I missed the most from Hawaii. Honolulu has a fish auction at 5:30am, 6 days a week, where a group of buyers move from fish to fish, bidding on each one. It is the only tuna auction of its kind in the U.S., and the competitive bidding process does seem to have a profound effect on the quality of fish found at Hawaii's sushi restaurants. 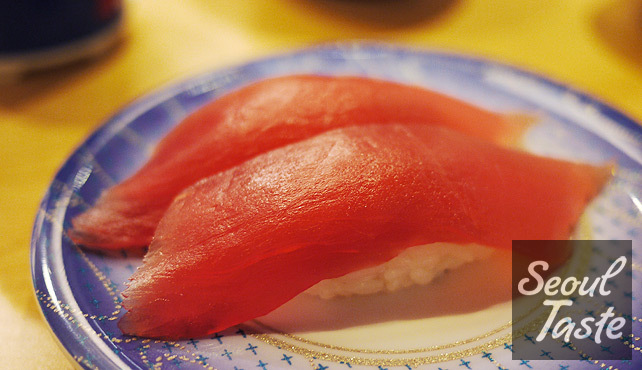 The tuna at Gatten can't quite satisfy our palates, but they weren't so bad. We recommend going with the regular 2600원 plate for this one, since the more expensive variety offered was a bit fishy for my taste. 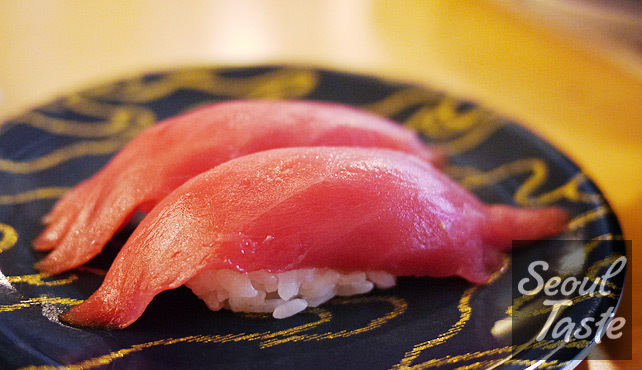 We haven't yet tried the fatty tuna, which comes in at 5600원 a plate. We're definitely going back for more. 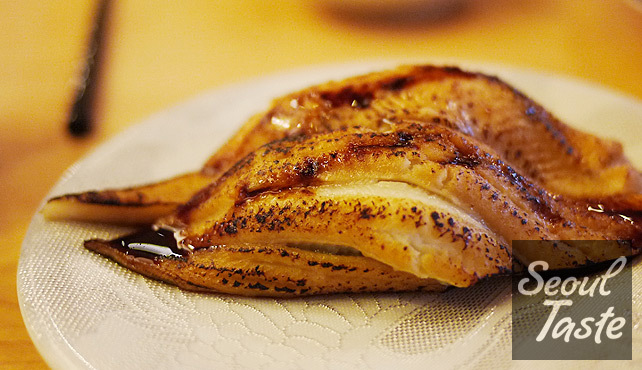 The grilled and torched items are a nice change of pace if you get tired of raw fish. We decided to end our meal with a Japanese dessert. We were expecting to find green tea ice cream, but this oddly-named dessert was the next best thing. It was served on a nice black stoneware plate, and it was covered with thin scoops (slices?) of Haagen-Daaz vanilla ice cream. In the middle, we discovered steamy sweet potato hiding. I guess this is a "Fire-and-Ice" concept, and it went together surprisingly well. 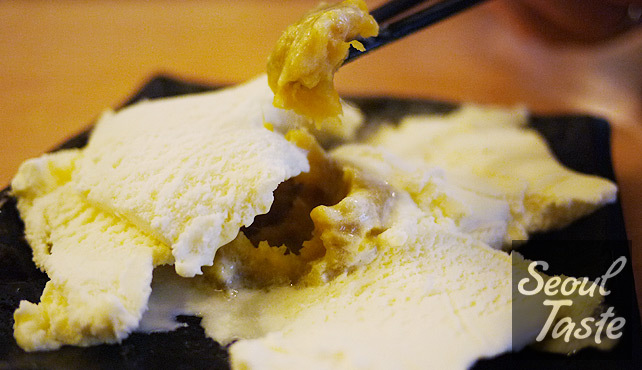 We polished off this dessert quickly (with chopsticks, no less). Food: 3/5 - Most authentic Japanese conveyor belt sushi plate we found so far, but still hesitant to give it high marks. Still, quality is above average, and definitely worth a try. Atmosphere: 4/5 - Provides many seating options, even private rooms. Casual and lively.